Numbers mean more to Mona Gray than they do to the average person. Mona knocks on wood, adds her steps, and multiplies people in the park against one another. The inner order and beauty of numbers help hold her fears and desires at bay. For much of her life, Mona has lived in the shadow of an unnamed illness that haunts her father. Soon after he contracted his disease, Mona became a quitter, and though she relishes and excels at many things, she always wills herself to quit. It is a sacrifice that, like her various rituals, helps her maintain a precarious equilibrium. And yet, the difficult and wonderful facts of life keep intruding on her tidy universe. When she begins teaching math, Mona finds a receptive audience in her class of second-graders, students capable of seeing the splendor and significance of numbers. Then the new science teacher arrives, with his unnerving way of seeing straight through Mona’s intricately built façade, and her carefully ordered world is threatened by love, the supreme disorder. Published in 2000, 256 pages. 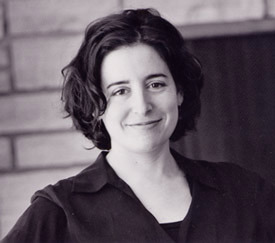 Aimee Bender is the author of four books: The Girl in the Flammable Skirt (1998) which was a NY Times Notable Book, An Invisible Sign of My Own (2000) which was an L.A. Times pick of the year, Willful Creatures (2005) which was nominated by The Believer as one of the best books of the year, and The Particular Sadness of Lemon Cake (2010) which recently won the SCIBA award for best fiction, and an Alex Award. Her short fiction has been published in Granta, GQ, Harper’s, Tin House, McSweeney’s, The Paris Review, and many more places, as well as heard on PRI’s This American Life and Selected Shorts. She has received two Pushcart prizes, and was nominated for the TipTree award in 2005, and the Shirley Jackson short story award in 2010. Her fiction has been translated into sixteen languages. What does the story in the Prologue mean? What, if any, is the significance of Mona’s dad telling her the story on her 10th birthday, the same year he got sick? Mona’s peculiarities are introduced in Chapter 1 in a reverse chronological list of birthdays. What were your first impressions of her character? “I am in love with stopping. It’s a fine art, when you think about it. To quit well requires an intuitive sense of beauty; you have to feel the moment of turn, right when desire makes an appearance, here is the instant to be severed, whack, this is the moment where quitting is ripe as a peach turning sweet on the vine…” Why is Mona in love with stopping? What are some of the ways that this has affected her life? Numbers help Mona make sense of the world and bring respite from her anxieties. How do other characters in the story make sense of the world? Does Mona have other role models for coping with anxieties? Some readers may have to suspend their disbelief that a young woman would be put in the elementary classroom without a college degree. Is it plausible that a school district would place an adult without a teaching certificate alone in a classroom? Why does the second grade class hold special interest for Mona? “His name was Mr. Smith, but he didn’t look like a Mr. Smith.” Why does Mona think that Mr. Smith doesn’t look like a Mr. Smith? Does Mona (Ms. Gray) look like a Ms. Gray? Do we expect people to resemble their names? How are Mr. Smith and Ms. Gray similar? How are they different? Lisa Venus, the student whose mother has eye cancer, is a particularly sympathetic character. What role does she play in the novel? What role does she play in Mona’s life? From the descriptions in the book, what do you think is wrong with Mona’s father? The 2011 movie adaptation stayed relatively true to the book’s whimsical quirky nature, depicting Mona’s counting as filaments of gold numbers bouncing off objects, and keeping all of the main characters as eccentric as they are in the book. Critics gave the movie overwhelmingly negative reviews, but if you liked the book, you will probably like the movie, too. Do you agree or disagree that this quirky book did not adapt well as a movie? Why/why not? The writing style of the novel, especially in Part One, features some post-modern conventions like looping sentences and fragments to convey Mona’s experience of the world. Did this unique style help you or hinder you in enjoying Mona’s story? Some reviewers have described “An Invisible Sign of My Own” as like a fairy-tale, calling it humorous, exasperating, quirky or charming, claiming it shows a sensitivity to mental illness, or features impeccably drawn characters, or is wonderfully inventive. How would you describe this book? How do we protect ourselves from the things we fear the most? How does Mona? At the end of the book, Mona tells Lisa a story. How is the story Mona tells at the end of the book different from the story Mona’s father told in the Prologue? How has Mona changed? 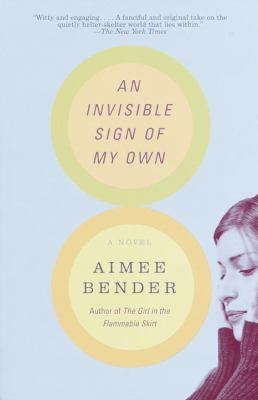 Download these discussion questions for An Invisible Sign of My Own by Aimee Bender as a 2 page printable PDF. Please share your thoughts about this title. What kind of day are you having today? Would you choose to wear a number that you hang around your neck? How do you advertise how you are feeling to people around you? Mona Gray’s eccentricities are certainly memorable. What other quirky fiction books have you read that have memorable characters?